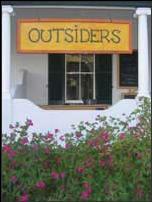 Accommodation in Nieu Bethesda is both comfortable and quirky. From a converted water tower to typical Karoo houses, our guesthouses offer you all you need to make a memorable home from home. All of these are self-catering, but meals are readily available from a variety of venues in the village. 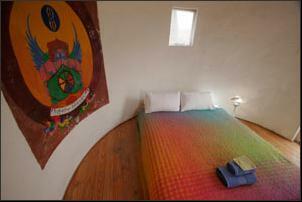 The choice of accommodation varies from farmhouse to backpackers; spacious to intimate. Please remember that Nieu Bethesda has no petrol or ATM facilities, so come prepared. 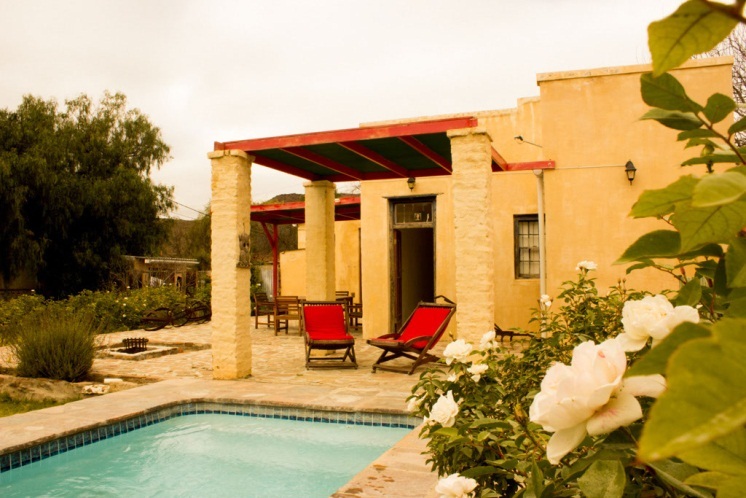 At The Ibis we invite you to enjoy Pure Karoo Luxury. 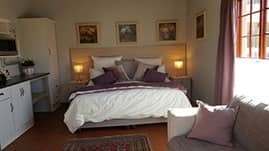 Enjoy the bed and breakfast accommodation with a choice of The Karoo Room, Amore Room or The Happy Room. All our rooms have essential amenities to make your stay that much more comfortable. Each features an en-suite bathroom, toiletries, DSTV, uncapped Wi-Fi ,electric blankets, heater, fan, mini fridge and coffee making facilities. Relax in the beautiful private rose garden with swimming pool and fire-pit. Bright & cheerful old Karoo house in a Zen-inspired walled garden. 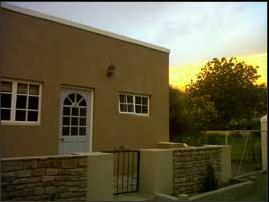 2 bedrooms and a garden room sleep up to 10 people. Open plan kitchen, dining and lounge area. Single bathroom with shower, bath and toilet. 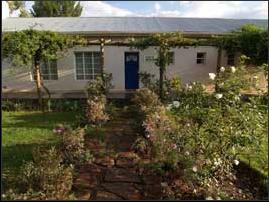 Self-contained garden cottage with twin beds, kitchenette, shower and toilet. 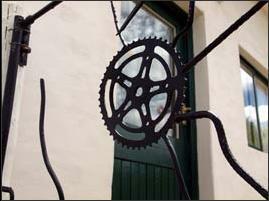 Self catering establishment consisting of two fully equipped cottages. Each unit sleeps 4 people with lounge, open plan kitchen & bedroom with bathroom en-suite. On the premises is a swimming pool,braai facilities,and coffee shop. Comfortable en-suite rooms, each with separate entrance from stoep, best views in town, centrally situated. Sunshine pours into this modern self-catering house with great views of the Compassberg. 2 bedrooms (1 en-suite), open plan kitchen, dining and lounge area. Sleeps up to 6 people. 3*** Highly recommended luxury self catering cottage situated at one of the best spots in Nieu Bethesda overlooking beautiful mountain views. Tranquil and peacefull. Sleeps 2. 1 Double-ensuite bedroom in the main house sleeps 2. Just 2 minutes walk from the Owl House. Dorm beds, doubles, singles and camping in this bright, clean home from home in the heart of Nieu Bethesda. On the main street, 5 minutes walk from the Owl House. 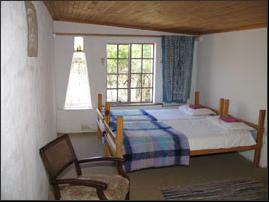 Double rooms, each with private entrance and stoep, on the main street. Modern open plan units – self catering, sleeps 4 each, offers a quiet retreat on the edge of town with garden & stunning views. 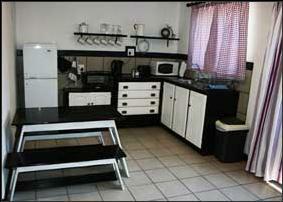 Luxurious beds, fresh linen, bathroom en-suite, braai-facilities & fully equipped kitchenette. Double bed and sundeck up narrow steps above kitchenette. Private shower and composting toilet attached. 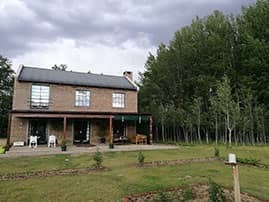 Charming accommodation where beds are covered by quilts made in the Arts Centre and the on-site restaurant offers excellent meals. 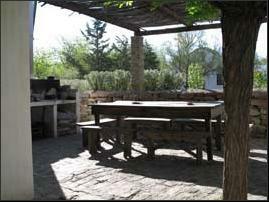 Pleasant courtyard with braai facility. Two bedrooms, one with twin beds (sleeps 3) and one with a double bed. A Fairy-tale tower three stories high famous for its romantic round bed and twisted staircase. The ideal breakaway for two. Luxurious kingsize bed. 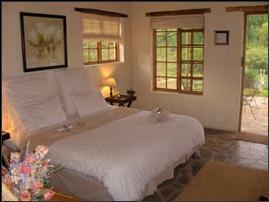 Romantic, cosy and comfortable with stunning views of Compassberg. Quiet, private enclosed garden with braai facilities and parking. Everything caters for your comfort. Fully equipped kitchenette. Hosts close at hand.